It's very easy! Fine tuning for all guitarists. 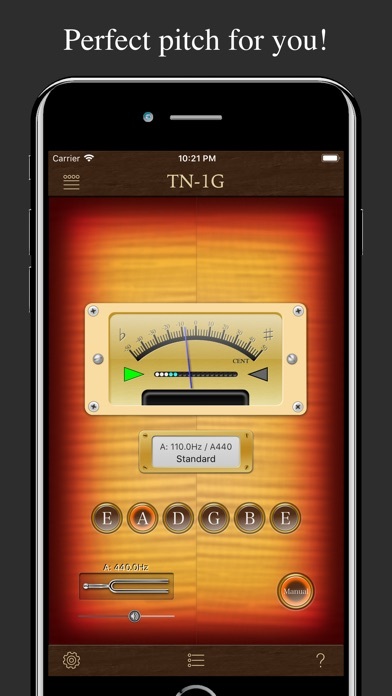 TN-1G is tuning meter only for guitarists. It detects the pitch of notes that picked up by a microphone, and it displays the difference from the right pitch. It's easy to use, but high-precision, high-performance, and supports alternative tuning sets of more than 50.
â—†It's really easy to use. â—†It has a simple drum machine function. ãƒ»The rhythm pattern that you made, you can send to your friend by AirDrop or email. ãƒ»And also the data is a common use with TN-1B(bass tuner), you can share the rhythm pattern with the bassist of your band. â—†You can change reference pitch-A between 438Hz and 445Hz. â—†You can change note notation language. â—†TN-1G has a tuning fork that emits a pitch corresponding to each string.